Uh-huh. Did you see that? You should have. It ran twice. Green Bay lined up for a 3 pointer but punter Tim Masthay passed to tight end Tom Crabtree for a 27-yard touchdown. "Tom who?" Unfinished and I asked each other. I checked Wikipedia. Crabtree used to play for the Packers practice squad. Practice squad for frak sake, before he made the line up as third string TE. Married June 28, 2009 to Chelsea Crabtree. Has a son Bryce Thomas Crabtree born October 14, 2010 and is expecting his second child, a baby girl. Tom Crabtree also has two dogs: Molly a Boston Terrier and Charlie a Pug. No wonder they gave him the ball. No one on the other team knows who the hell he is! 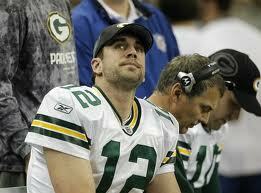 And where was NFL MVP QB Aaron Rodgers in all this? Well, my Nancy quarterback - or should I say Evelyn - was over on the sidelines resting up after his all out effort to earn 12 fantasy points. Hell, my back up QB Ben Roethlisberger earned 21 points this week. That wasn't all. I chose Chicago RB Michael Bush who earned 5 points to play this week. On my bench sat Miami RB Reggie Bush who would have given me 38 points. Yeah, I guess a Bush on the bench is worth almost 9 on the field. To say nothing of how many Evelyns. Way to play Fantasy Football Evelyn. This post originally appeared at Humor Bloggers Fantasy Football League blog. It's such a crap shoot from week to week. I've gotta get my act together this week. "la la la la I can't hear you!" Um, Meleah, I think you have to cover your eyes not plug your ears in order not to read this. Do you think I'm taking this football thing too seriously?